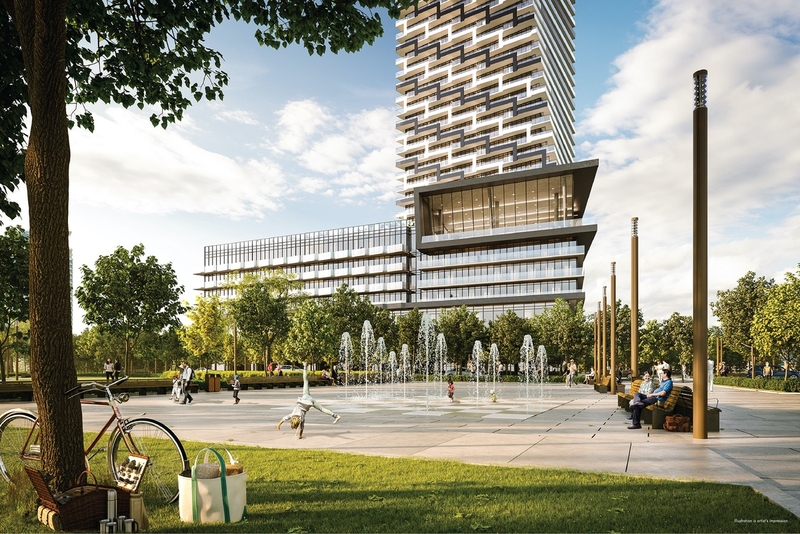 M3 Condos is the 81 storey third phase of the popular M City Redevelopment in the heart of downtown Mississauga by the Rogers Development Group. This tower is set to become a game changer in Mississauga and will become one of the top 5 tallest condos in the GTA. M City Phase 1 and 2 launches in 2017 to roaring success. The buildings were highlighted by stunning architecture and the promise of an incredible master planned community to be developed as “M City”. Both Phase 1 and 2 are now under construction. Master Planned Communities make excellent investments – we are huge fans of master planned communities. Invest early and watch your money grow. Roy Bhandari: Welcome everybody, my name is Roy Bhandari with Talkcondo.com and today we are the amazing sales office for M City and we are delighted to be joined today by John Anderton, the VP with Rogers Private Companies, Mark Reeve the co-founder of Urban Capital, and we’re delighted to be joined by Mansoor Kazerouni, the global director of IBI Architects. Roy Bhandari: We’ve got a lot to cover today. We are obviously here to talk about M City Phase 3. It’s impossible to talk about M City Phase 3 without first talking about the success about M City Phase 1 and 2. We were sat here, 16, 17 months ago, I was wearing this exact same tie talking to you guys, and we were just looking forward to what would turn out to be, I think probably, the most successful launch of the year. The demand was insane, the community really gravitated towards Rogers and Urban Capital, put together and I’d just love to get your take and pick your brain on what was it? What was the magical formula there that people really gravitated towards? John Anderton: Including you, for all the support that we got from [crosstalk 00:02:25]. Roy Bhandari: I really appreciate it. So, obviously M 1 and 2 were a part of the puzzle, and you touched on the location, because a really important piece of the puzzle here is the location. I do want to spend a little bit of time talking about this location. Today, we may have [inaudible 00:02:42] talk about the future of Mississauga, and the passion she saw about what was coming. This is really about city building, and this is our opportunity to do this right. We’ve got one shot, we’ve got a really important piece of land here in Mississauga, and so I’d love to get your take on the city building. We’re gonna talk about the 80 stories, of course. Roy Bhandari: A big, important piece for me is where it meets the ground. That’s where we are going to be walking around, that is what we’re gonna see and feel, and I’d love to get your take on that level. Mansoor Kazerouni: Well, that is a really important component of any project, and more so in the master plan community where the ambition of the project is to create community, and so how these projects interact with the public realm and facilitate that creation of community is very important. I think this project does that in an amazing manner. Mansoor Kazerouni: First of all, its location within the master plan, it is truly centre ice, even at the centre of the M City master plan. As you can see on that model, there’s a two acre park immediately to the south of the podium there, which immediately becomes an amenity and a gathering place for the entire community. You’ve got wonderful, two-story high great, related townhouse units overlooking the park, very wonderful for young families who want to live there, private little patios, immediate access to a park ride, right across the street. Great living environment. You wrap the corner, and that southeast corner is marked by the ability to do some food and beverage facility with great wide open patios that open out to the linear park to the east. That is gonna further contribute to the animation of that public realm, and then you’ve got the spectacular lobby which becomes the eyes on the street at all hours of the days and night. It contributes to the safety of the environment, and then furthermore retail on [inaudible 00:04:58] wrapping the corner again onto the street to the west. Mansoor Kazerouni: So, really, a very engaging and animated public realm that addresses the context on which it sits and elevates the quality of this part of Mississauga. Roy Bhandari: There’s a couple of things that you said that I wanted to very quickly unpack, and I think you talked about the park. I personally believe the park is such an integral piece of the puzzle of this whole thing. That could easily have been another tower, getting back to the city, getting back to the community, and you can just sort of envision it now all around the park there are gonna be these amazing coffee shops and restaurants and you already alluded to that, and that really brings the entire community together and, I think that’s really important, especially when you’re doing a master plan. We’ve seen master plans done right. We’ve seen master plans done wrong, and we know the elements to pull from, and that’s why we are confident in bringing our clients here because we know that this is a master plan done right. Roy Bhandari: Did you have anything to add, Mark? Mark Reeve: I was gonna say that you know we spend like, there are some examples of buildings in the city where they didn’t get it right, where a building when it comes to grade does not perform well, it’s not pedestrian friendly, so we did put a lot of thought into the pedestrian realm and the condition of what the experience is gonna be at the street level, because we share your view that what happens down there really defines the community: how great and how livable a community is. The towers can be iconic, but what happens at the street level really is how people actually live and work in the environment. John Anderton: [crosstalk 00:06:32] proximity to transit and the new [crosstalk 00:06:35] coming very close to our front door adds an element of livability to the whole equation and connection to Mississauga square 1, which is not too far a walk away from anything, and a public library, and it’s just the central location of this development is what is so appealing. Roy Bhandari: Yeah, I love the [inaudible 00:06:59], the [inaudible 00:06:59] is gonna have such an important factor for this location, but it is right now how easy it is to get to downtown as sort of the benchmark. This changes that, because it’s straight down to Lakeshore which is connected directly to downtown, so that in itself is a game changer for the area as well. Roy Bhandari: So, we talked about the location, we talked about the master plan. One of the other things I think that is really important here is the Rogers group involved. I remember talking a year ago and how you guys looked at this as a legacy project. This is not about building 1, 2, 3, 4, 5, 6, 7, 8 towers, but it’s about leaving the legacy behind in this plot of land that has been so important for the Rogers family. As it gets developed, we’re seeing that vision come to realization, and I’d love you to talk to us a little bit about that. John Anderton: Well, again, it was approached as a master plan so we want to make sure that we got all the elements of it right, and as we proceeded through, the learnings that we’ve taken from buildings 1 and 2 are being applied into building 3, and they will flow into the next 4 or 5 buildings that end up coming on site. 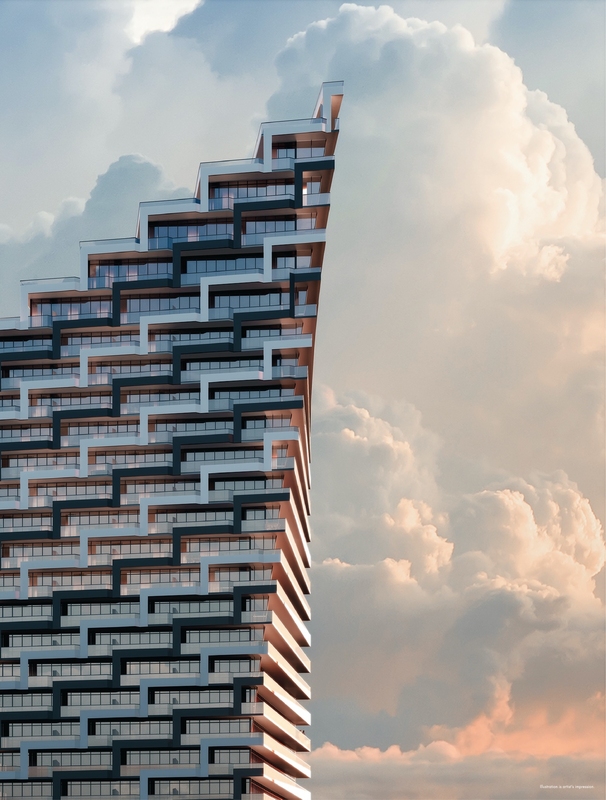 We approach it very much from the technology-forward standpoint, so we are looking at building the latest technologies into these buildings but also having the ability to build on top of those technologies as they evolve into the future. So, these buildings will be 5G ready when they’re done. Mark Reeve: We should also talk to how excited the whole family has been about this project. John Anderton: Exactly, they have embraced it just tremendously. They embrace the original vision, and as they see these things coming to fruition, the excitement has just been building and they’re really excited to see these things go through. Mark Reeve: We couldn’t hope to have a better benefactor than the Rogers family because they have been very supportive and what you’re seeing is the results of their support. John Anderton: And their history with Mississauga goes back many, many years. That legacy alone is built into the reputation and holds very near and dearly to their hearts, so they want to make sure that this is something that is done right. Roy Bhandari: That leads me to a nice, little tangent, a short tangent, but an important tangent, and that’s the fact that phase 1 and 2 are already under construction. The turnaround time from day 1 of sales to today, the time you guys had shovels in the ground, 13, 14 months, which is remarkable for a project of this scope and is really, really important to see. John Anderton: I think everyone needs to watch this part of the video. Mark Reeve: He seemed to think it was taking too long. You know, there is quite a process involved which getting all the production documents together, the construction documents, working drawings, specifications, that’s where the architects, and the whole team, has to spend a lot of time getting everything organized. We’d like to do it faster, if we could. Certainly not any slower. Roy Bhandari: For sure, that’s awesome. No, we’re really excited about that, and it’s an important message to share. 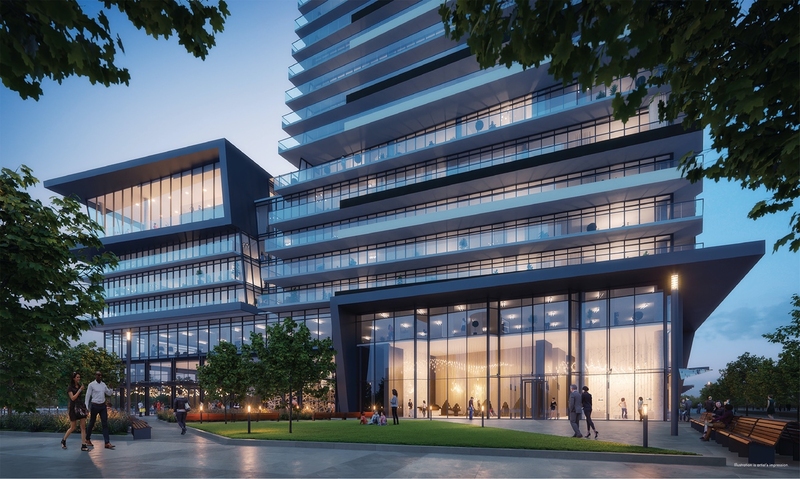 Roy Bhandari: I want to transition to what I think most people will talk about when they see the rendering for M City Phase 3, and we were at the press conference today and as soon as you click the slide, there was a gasp in the room that was like “Wow”. The initial reaction was that of excitement. Obviously the size is gonna take center stage here, it’s an 81 story tower, bringing it on par to the tallest buildings we have in downtown Toronto. Roy Bhandari: I think my first question is on the height is, what about this neighborhood and where we’re at in Mississauga, because I think building 80 stories in Mississauga, it sends a message. 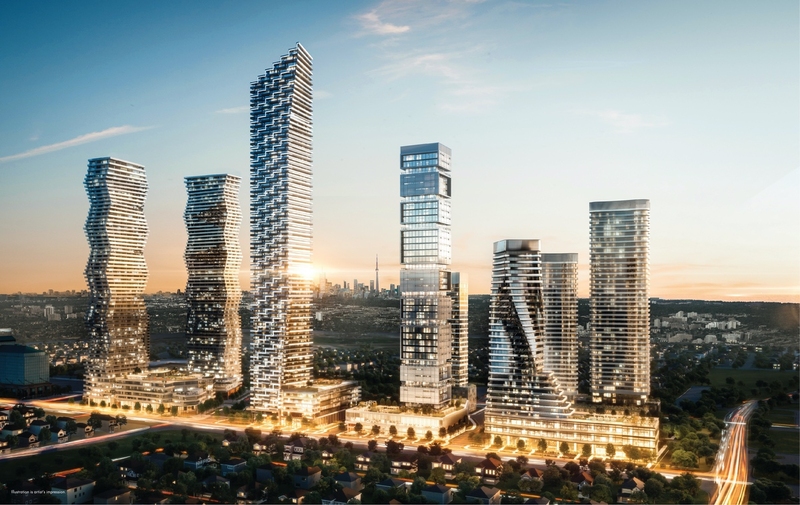 The team here obviously believes Mississauga is ready for this, and I’d love to hear your take on why 80 stories today in Mississauga before we get into some of the real design elements, and that one is open to anybody that wants to jump in. John Anderton: Well, Mississauga is the 6th largest municipality in Canada, I mean it’s growing everyday so this is a tremendous lift for the city. Roy Bhandari: It is, 100% it is. John Anderton: It puts it really onto the map. Mansoor Kazerouni: I think Mississauga recognized a while ago the role that our architecture can play in city building and civic growth. It was evidenced by the first Marilyn Monroe buildings, I believe M 1 and M 2 are going to do the same thing. They really put Mississauga on the map, and I think this building is actually going to take that to another level. I think Mississauga is at that stage in it’s growth and evolution that a tall building such as this one is warranted here. This site is one where in terms of it’s location, on this master plan, this is the most appropriate location for a very tall building. It fronts directly onto the park, it kind of holds its own as the centerpiece of this development, and I think there are a number of these reasons which collectively lead you to believe that is a really natural choice. I have to say that we broke the mold a little bit on the design competition where we took it higher than it was originally anticipated and good for Mark and John to embrace that, and believe in it, and obviously test the idea and see it through. Mark Reeve: Well I think first of all, the scale of what we’re doing is massive here, and I think the answer to that question is why wouldn’t you? Why wouldn’t you go out and ask five of the top firms in Canada to give you ideas for what you do with the property. So, we felt that it was a very small investment, and it was in the scheme of things, to make sure we got the absolute best design, and that’s what we achieved. So, the design competition when you get into this scale of development, I think is almost a must. Roy Bhandari: Awesome. I like to see that. Mansoor Kazerouni: If I can just add to that, I wanna say that we’re not huge fans of design competitions. We, as architects, and partly because we’ve got a very loyal steam of repeat clients based on the excellent creativity and service that we bring to the table, but when Mark contacted us about doing this design competition, it was a no-brainer. It took no time to agree to do it because we recognized the incredible opportunity that this presents, in terms of really demonstrating the talent and capabilities of our team. So, on this one, we were all in on doing a competition. Roy Bhandari: So could it be a better transition to talk to us a little bit about what’s going on there, as there are some very unique things going on in this building, so I’d love for you to talk us through some of the key points. 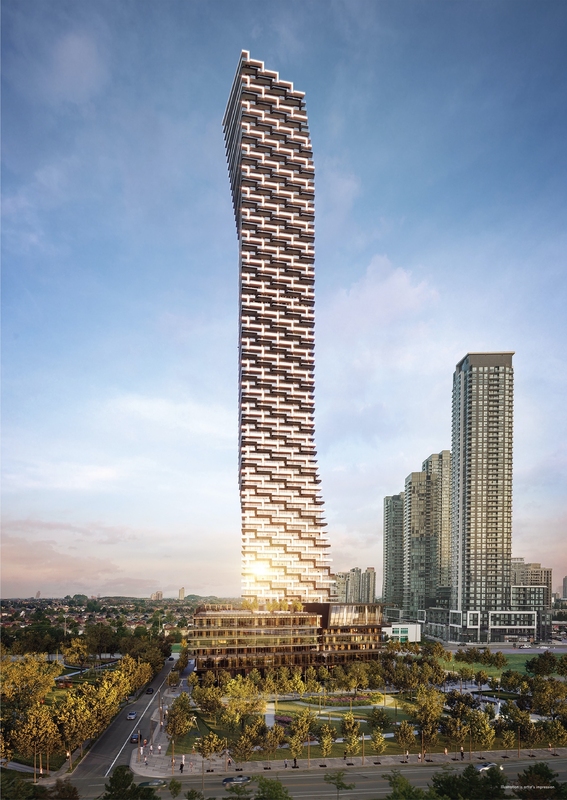 Mansoor Kazerouni: Well, as you heard earlier, when we started and kind of looked at the skyline of Mississauga, obviously there’s two sort of, defining projects, one is the Marilyn Monroe towers which had this unique, curving, linear, twist to them, and then there’s M 1 and M 2, which have a lot of movement in the form, and we had to think of “how is M 3 going to stand on its own? How will it hold itself architecturally, and frankly, raise the bar on architectural excellence?”, and we looked at the open context, we looked at the notion of these skewed grids that exist in the city of Mississauga, and the idea that there’s a lot of twist that’s happened, and so, how do you do a twist with a twist? Roy Bhandari: There are terraces up there? Mansoor Kazerouni: There are terraces up there, and they afford incredible views unlike any other experience in the city because these heights don’t exist in the city. So, that’s really how the architectural expression for this building came about. Roy Bhandari: Awesome. No, I think it’s incredible. Like I said, when they unveiled the rendering, you could hear the gasp in the room, and I don’t think you could ask for a better reaction than that. Mansoor Kazerouni: The community has been very positive on the renderings as well. Roy Bhandari: So, we talked about the location, we talked about Rogers, we didn’t actually talk about Urban Capital. I do want to bring this up because when I said a year ago: what happened here for me was the perfect marriage of vision and what Urban Capital brings to the table. The Rogers family obviously wanted to build something very special, and the kind of buildings that Urban Capital and downtown are known for are these very unique, one-of-a-kind buildings that most other developers don’t go near. So, I’d love for you to just touch on that for us. Mark Reeve: Well this all started almost ten years ago, John and I started to work together on this, and I promised him one thing when we first got going, I said “I’m gonna make you guys look great.” So far so good. So, we’ve been working on this quite some time through the whole planning process with the community with Cooper Robinson out in New York, they’re amazing as well. Our company has done many projects, we’re 21 years in business now and we’re building across Canada, my co-founding partner spends a lot of time in other cities. I tend to spend a little bit more time in Toronto. The one thing that sets us apart from most other developers is our interest in doing high design buildings. There’s not one building we’re not proud of in terms of a design perspective, and we set out on every project we do to try to make it special, architecturally and this speaks for itself, and it’s going to be spectacular. Roy Bhandari: Awesome. There are a couple more things I did want to touch on, and the first one is floor plans. We talked about other buildings, and that it’s really difficult to create unique exterior while maintaining important floor plans and to make sure we have efficient floor plans, and I’d like you to touch on that briefly. I think M City knocked it out of the park last year by creating these amazing, unique building designs but not sacrificing on the floor plans. I’d love to hear your take on that. Again, with M 3 coming up. Mansoor Kazerouni: Well we strongly subscribe to the idea that form for the sake of form is never great, because architectural evidence is not derived just by creating spectacular-looking buildings, but really they need to fully address the function that those spectacular forms embody. For us, designing very efficient and functional, and most importantly, livable units, is of primary importance. So, obviously, functionality is key, but the ability to furnish them well, to actually be able to live in them, to have adequate storage, to not have wasted nooks and crannies. Little things that make a big difference. Roy Bhandari: We see on the frontline everyday, everything you just mentioned we see and talk to clients, and these are the things they bring up. Mansoor Kazerouni: Very important, and those are the kind of things we concern ourselves with as we are laying out these units. Mark Reeve: If I could add that when we set about evaluating five different designs from great architects, how do you determine which one you’re gonna pick? So, there were really three principle things: is it a beautiful, iconic building? First and foremost, we want it to be that, but the floor plans have to be terrific. There’s no point in having a building where nobody is going to buy a unit because you can’t get a proper floor plan. And so, the last thing is destructibility: can we deliver the project as envisioned by the architect, at a price point that the market is gonna want. So, is it still affordable? So, those are the three principle things. Mark Reeve: You would think so, but no, it’s not as simple as you might think. John Anderton: Simple but hard to get right. Mark Reeve: Hard to get right, absolutely. Roy Bhandari: Awesome. Is there anything I missed that we think we should have talked about that we didn’t? Mark Reeve: I just want to add one thing about when we talk about what’s going on here in Mississauga, it’s Mississauga’s turn. Downtown is largely built up, they’re rolled up the welcome wagon in downtown Toronto, they’re downzoning in many places. They don’t seem to want much more development down there, is the sense I’ve gotten. Mississauga is growing and embracing growth, and it’s a positive environment for us to do business in so I think it’s fantastic to see what’s going on out here. Roy Bhandari: Awesome, and if our clients are interested in purchasing an M City 3, what do they got to do? Mark Reeve: Well, we’re gonna be in this sales office where we are right now is just being re-modeled to accommodate the M 3 launch, which will be occurring in approximately three weeks time, around the 18th of the month of October. Mark Reeve: So, they should get in touch with you. Roy Bhandari: Get in touch with me. We’re really excited. I wanna thank you all for your time, and we really look forward to bringing our clients to M City Phase 3.